Want to find out all you can about used homeschooling materials? Read over this article and my comments at the end and you should know everything you need to know about how to buy and sell curriculum and books. Remember those days in college when at the end of the semester you would line up at the college bookstore to sell your used textbooks? Do you recall later going to that same book store before the start of the next semester to try to find used books for your courses? Well, now that you have decided to homeschool your children, you can use that same approach to offset some of the costs associated with homeschooling. There are creative ways to cut the costs of your child's education. Used homeschooling books and supplies are available at many sources on the Internet. Some of them can be found by clicking the links below. Parents forums are another way of finding recycled items and of course selling those materials you will no longer need for your children's education. From textbooks to software programs, calculators, sometimes even computers, parents can let their "fingers do the walking," to use an ad slogan of a yellow pages advertisement, by surfing the Internet to find used homeschooling items and to sell their materials which are no longer needed. Many curriculum providers sponsor electronic message boards where parents have direct access to other parents for selling, trading, and exchanging items needed for their home school. Oftentimes prices are very low and reasonable. Sometimes, you will be surprised to find items right in your own neighborhood. Some homeschooling schools and associations also provide message boards and forums where such activity can be carried out. It makes good cents to take advantage of these opportunities to save money and also contribute to the Green Revolution by engaging in recycling. You also help to avoid clutter in your home by getting rid of educational items you no longer need. Not only do you benefit, the parents from who you buy and sell also benefit and so does the environment. My Comments on the above article: I love using used homeschooling materials to help me homeschool my children. It's just about the only way we have survived so far. Most homeschool families live on one income since one parent is at home teaching. Some families have home businesses or have the mother work part time inside or outside the home, but for the most part funds are limited. I have found various sites that I like and those that I don't like. 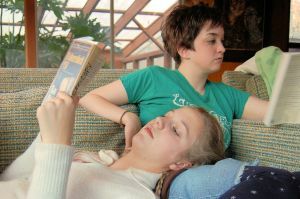 I have had good success both buying and selling used homeschool material at www.homeschoolclassifieds.com. Their site is easy to search and has a good amount of materials for sale there. Vegsource is a site that I didn't like. I thought it was too hard to read through all the posts to see if I could find what I was looking for. I also didn't have much luck selling there either. I have a love/hate relationship with ebay. When I buy something for a good price or sell something for a good price, I love it. But when I don't sell an item or sell an item for much less than I think it is worth, all the extra fees and costs of selling on ebay really get to me. The best time to buy on ebay is from November to April. The best time to sell used homeschooling materials on ebay is May to October, when most people buy their books. There is no need to feel bad if you can't afford the latest and greatest curriculum package. Chances are you would have become burdened by it anyways. When you buy your material used, you don't feel as obligated to complete it if you purchased it for a fraction of the cost. I'm not saying you should just stop and start using books that you buy, but sometimes there are cases when completing a book that you purchased is obviously not in the best interest of your child. I love going to used curriculum sales in my area. It gives me a chance to look over materials to see if I think I will like them. If I see a lot of a certain book at a sale, usually that tells me that people didn't like it and want to get rid of it. Sometimes I even purchase items or sets that are cheap and resell them. After many years of homeschooling and buying and selling books, you can start to get a feel for what sells and what doesn't. Then you can have some extra money to buy the books that you will need for your family.